Midfielder Stuart Armstrong and winger Gary Mackay-Steven have joined Celtic from Dundee United after the clubs agreed deals on transfer deadline day. 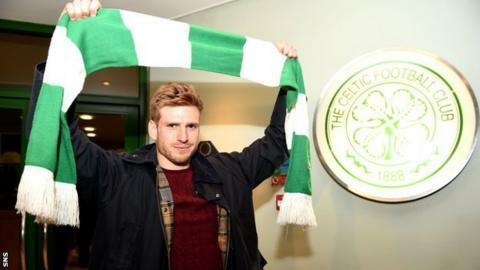 "I'm delighted to be here and to have signed on at such a massive club," Armstrong, 22, told BBC Scotland. Mackay-Steven added: "I'm absolutely delighted to be here and to get everything done and dusted today. It's been a crazy few hours but I'm over the moon." Celtic's increased £1.6m offer for Armstrong had been rejected on Sunday before further talks took place on Monday. The Scottish champions had a £1.5m offer for the Scotland Under-21 international rejected last week and Burnley also had a bid turned down. The £250,000 offer for Scotland cap Mackay-Steven was £100,000 more than they had previously offered. Armstrong, who has signed until 2018, and Mackay-Steven, whose deal runs until 2019, will be ineligible for Celtic's Scottish Cup meeting with Dundee on Saturday and next month's League Cup final meeting with their former club. United defeated Aberdeen 2-1 at Hampden Park in Saturday's semi-final, with Celtic recording a 2-0 victory over Rangers the following day. And United will ask for at least 17,500 tickets for the 15 March showpiece. The Tannadice board will also request that tickets outside of the corporate and main stand be priced at a maximum of £25 for adults and £10 for concessions. One director told BBC Scotland: "We want to ensure as big a crowd as possible for the game, which we are sure the sponsors would want too. "The game is being played in winter and, to make sure the game attracts as big a crowd as a possible, we will ask for tickets to be priced at a reasonable level. "That is very important for the fans of both clubs when money is tight." It is believed that United will also ask for the Toryglen end of the stadium to be reserved for their fans at a planning meeting on Tuesday with the Scottish Professional Football League about the final. However, BBC Scotland has learned that the SPFL will stick with tradition and allocate that end of the ground to Celtic fans.